Have You Used Tria Laser Hair Removal Yet? Tria Beauty is currently doing market Research on the Tria, and is looking for women who have or who are currently using the Tria, to follow up with them on the progress of their laser hair removal. Try on a Pair of Wet Seal Jeans, Score a Free Android Phone! Wet Seal announced on Facebook today, that anyone who comes into any one of their locations and tries on a pair of jeans, will get an Android Phone for FREE. Try on a pair of Jeans (you don’t have to buy anything) and they will give you a redemption card and tell you how to claim your new phone (with 2 year plan + data). This weekend was my 12th round of treatments. For light hair like mine, it can take 8-12 treatments. I was hoping to be more hairless by now. I seem to have patches on my legs, with hair still on the inner side of my shins. My bikini and line has a few stray hairs as well as my underarms. I didn’t shave this whole last month to see exactly how well it was working. Below are pictures of my month long hair growth. 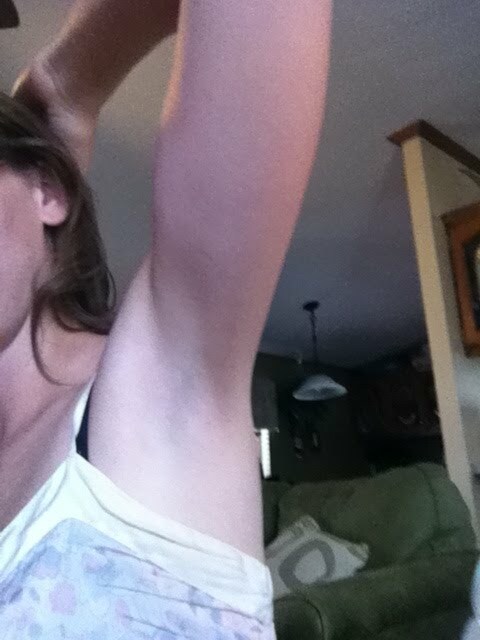 Its hard to see in the pics, but my under arms are barely noticeable and my leg hair is patchy, short, and very light. For a month of no shaving, its looking pretty darn good! I’m starting to see proof that its working! I was hoping to be farther along and just doing single spot treatments by now, but I’m still doing the entire leg, underarm and bikini line. By the way it was looking this month I think I’ll have maybe one ore two more treatments left. Here’s hoping! To see more of my journal updates on the Tria from the past 7 months, click HERE.